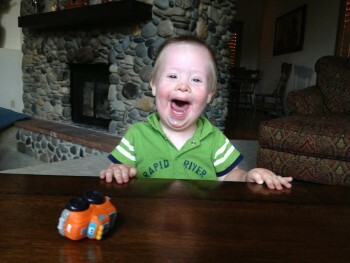 Daniel had his 18 month visit one week ago. His growth is slowing down, but evenly (and expectedly) so that’s nothing to worry about. He is 31 1/2 inches long (18%) 22 lbs 14 oz (31%) and his head is 18 1/4 inches around (21%.) He seems like such a big guy to me, but these stats say otherwise! (Some quick googling tells me these stats put him at about the 75% all around on the Down syndrome growth charts.) I’m glad though that he’s smallish, since I still have to carry him everywhere and that gets harder by the day. I’m REALLY hoping he’ll be walking by the time I have this next baby. We’ll see! His health is good, thyroid numbers are on target with his medicine, and he’s a happy guy. He is still farthest behind in gross motor, so we’re working extra on that with his occupational therapist and the once a month physical therapist. The questionnaires also have him very far behind in communication, but they focus almost completely on speech, so the pediatrician is less worried about that aspect. This face is VERY communicative. 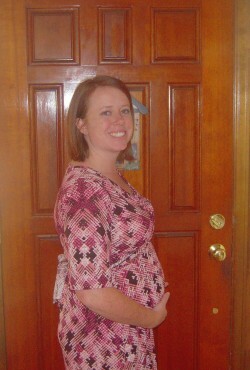 In other news, 17 weeks along over here. (Well, 17 1/2 now.) I feel like I look very obviously pregnant at this point, (even had a Target cashier comment on it!) but several people told me at church that they didn’t know I was pregnant. Sooooo maybe people just think I’m getting fat? Oh yeah, I also got my hair cut! And I was curious, so I asked her when I had come in last and she told me November of last year. Apparently I am lazier than I thought when it comes to keeping up with that. I saw your cute hair before I read the following picture and gasped, “WHEN DID SHE CUT HER HAIR? !” I love it. I love the haircut! I had a hair appointment today and should have asked when I last went in. It could have been right before last year’s Blathering. I never feel like it’s been a that long, but then boom. A year.